Deep inside, we all have a dream home. For those of us without degrees in architecture, those homes are often built from movies. Remember that scene in Beauty and the Beast? The one where the Beast leads Belle into the mansion’s enormous library. He opens the curtains to let in some light, and when she finally opens her eyes she’s nearly speechless. Ever since I first saw that movie as a child, my dream home has always included a library, though not necessarily the really hairy, moody guy that came with it in the movie. It's fun to sit and dream. It's, even more, fun to find ways to make our dreams part of our daily reality. While most of us don’t live in a 60-room castle, it’s still possible to find a spot in your home for a library nook. 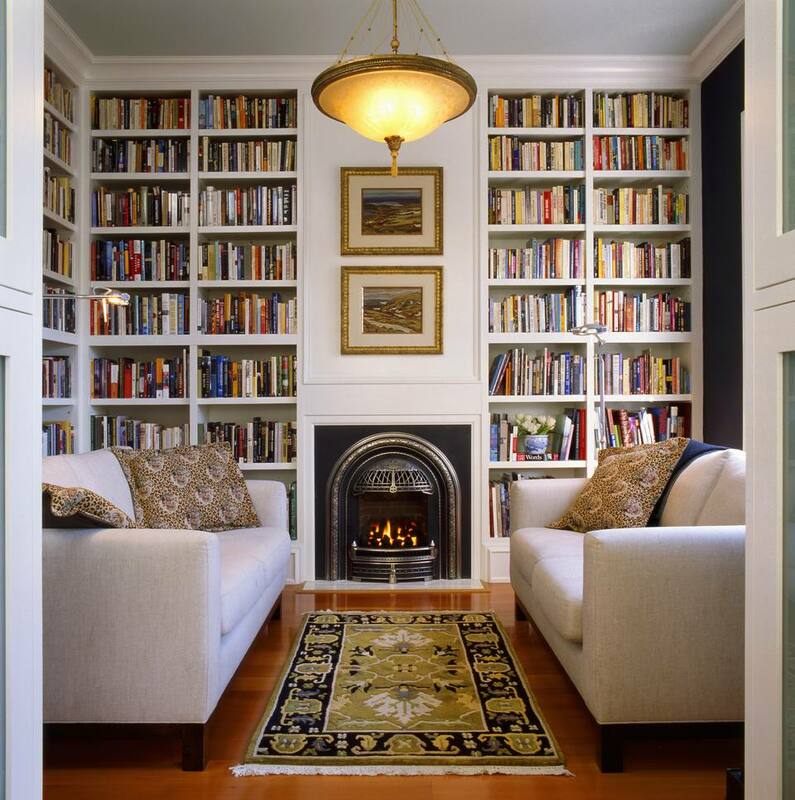 Even if it's somewhat less expansive than the several-stories-tall wonder depicted in the movie, a library nook adds an undeniable note of charm to a home while providing a cozy, inviting spot to sit and read – just like we dreamt about. So the key element with library nooks is, of course, shelving. Freestanding shelves are great if you’re the type who likes to switch up placement every so often, while built-ins offer a really polished look, giving the impression that the space is and always has been a library. I love this example because of the simple shelves sort of fade into the wall, emphasizing their contents. And because these spots are typically small, it’s a prime opportunity to add a bold element like a bright orange accent wall and fun pendant lighting. This nook makes use of limited space by building up, all the way to the ceiling. If extra space is at a premium in your home, don’t be afraid to build around a window or door. Areas in the home with large, blank walls like hallways are just begging to be turned into libraries. Line the wall with bookcases as tall as the ceiling for a built-in look. Track lighting and a runner help finish the space and make it feel like its own room, not just a hallway. If you don’t have enough books, use empty spots to display your collections or small pieces on their own. For a home library, natural light is the icing on the cake. A small bedroom makes for an ideal space to do double-duty as a library and a guest room or office. Here, the homeowner has covered opposite walls in bookcases, allowing for some lovely symmetry and the picture-frame window (with a window seat!) to be the focal point. A simple roller shade keeps things from getting too busy, and the green throw pillows seem to bring the outside in, making for a seriously tranquil spot to read. For those of us who like to fall asleep reading, there's really nothing better than this: A bookcase directly above of this daybed, making it the perfect space for someone to curl up in with a classic before dozing off for a nice, long siesta. It's also possible to recreate this idea with bookcases that aren’t so permanent. Try some stand-alone pieces like IKEA’s KALLAX set up the same way to turn your bed into an instant reading oasis.